CHARLES KRAUTHAMMER: I was interested to hear Megyn that women don't like the kind of in-your-face fighting that we basically saw in the debate. I can't speak for her gender, but I can speak on behalf of mine. We love this stuff. This was a boxing match, this was heavyweight. This was Frazier-Ali. Even the stage was sort of like an arena, a ring where they circled each other. At one point I thought they would sort of use their mikes as weapons, and it would turn into the Taiwanese Parliament where you get fantastic fistfights. Look, this was a very tough fight. I think Romney did about as well as he did last time around, he made his points. Obama clearly had a good night, a much better night than the first night. You know, Woody Allen said showing up is 80% of life, well he was at the 80%. And I think on points, if you were scoring it's on points, Obama wins on points. He made a lot of counter punches, a lot of accusations. He managed to get under Romney's skin a little bit by referring to his wealth, 'if you make $20 million a year,' trying to make a point about taxes. But it's a way to say you're a rich guy, how will you understand the ordinary guy? I thought there is a point where Romney did really well, I think all of us agree, that was on the larger general issue on the failure of this administration. And then, there was one tactical error that Romney made which was he kept asking the president questions. Every lawyer knows you never ask a question for which you don't already have the answer in already have the answer in hand. And that gave obama a chance to counterpunch. We've got Candy Crowley's intervention, which is essentially incorrect, supporting Obama on the transcript. He did not call it's a terror incident. There was a big opening that was missed. I think it was contaminated by the actions of the moderator. But again, on the big issue, that one where I think Romney could really have scored, he missed an opportunity and that's probably why, I think on points, Obama came out ahead. BRET BAIER: Charles, we've talked about Libya quite a bit on "Special Report." The president said tonight, as soon as he heard that the Benghazi consulate was attacked, he was on the phone with his national security team telling them to find out how it happened, to make sure that security was tightened, and to get to the bottom of it. Now, we hear that the intelligence, weeks later, they're saying was wrong. And that they blamed this anti-Islam video, including the president saying it six times at the United Nations. Does that answer square and will the fallout from that be a problem for this White House? 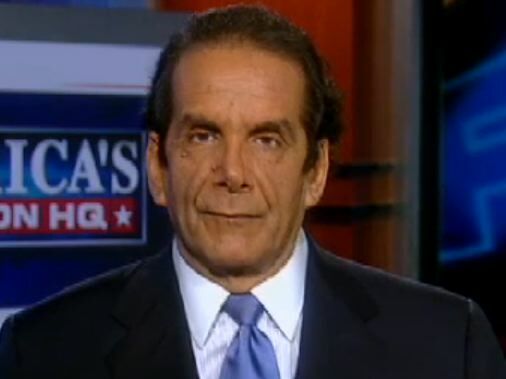 KRAUTHAMMER: I think it will be a problem for the White House. They have clearly told untruths, fictions. The president perpetrated them two weeks later on Letterman when he spoke about Libya in the context of the video when everybody knew it was not an issue at the time. So I think on the facts, on explaining Libya, yes, it's going do be a huge problem, but it will be a huge problem in a few days. Right now, in the context of the debate, I think he got away with it because there was no actual response at the time on the stage and when you had moderator meeting in behalf of Obama, that I think swung it in a way that was basically incorrect and unfair.